1. Put the vegetables into a large saucepan with the garlic, rosemary, stock and sugar. Season well, stir, bring to a simmer and cover. Cook gently for 15 minutes or until the vegetables are just tender. 2. Preheat the grill to high. 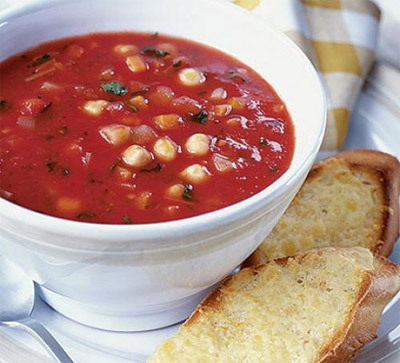 Whizz the tomatoes in a food processor or blender until smooth, then tip into the vegetables with the chickpeas and parsley. Gently heat through, stirring now and then. 3. For the toasts: Rub both sides of the bread with the garlic. Grill on one side until golden, turn the bread over, cover with cheese and grill until it's bubbling. Serve at once with the piping hot soup.